Added Tourmaline to drop tables (grade 1 to 3 only). You can find this under the Messages category. Added an option to change the appearance of Status Icons. You can now press Shift + Click on the [+] buttons to increase your stats by more than 1 at a time. When playing the game and with Discord open (note: this will not work if you use their website! ), your status on Discord will now update depending on what you're doing in-game. Your characters name, level and class will display to other Discord users. If you're inside a Game Arena, the Game Arena will be displayed as well as how long you've currently been in there for. This will only work for the first game client which you log in. If you close your first game client, another game client will start to up Discord instead. An option has been added to 'Messages' which allows you to turn this on or off. 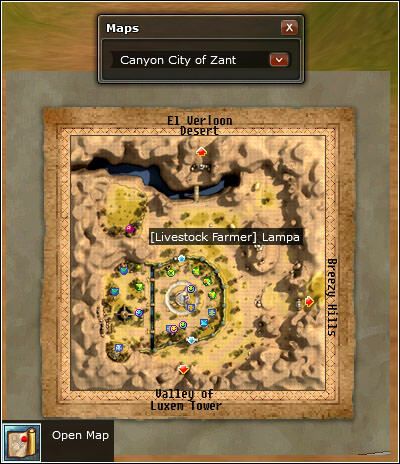 This new skill allows you to view a full sized map including the NPC positions across the entire map. You will only be able to view maps of ones which you have previously visited. We've added this as a default Basic Skill for new characters and existing characters can learn the skillbook buy purchasing it from [Righteous Crusader] Leonard in the Canyon City of Zant. 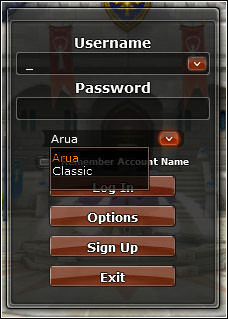 Once launched, players will be able to switch between the 'Arua' and 'Classic' games directly from the login screen using the same game client. Edited Tourmaline's colour to white. Edited the map and objects to improve client performance. Edited the lighting of the map to be similar to other Eldeon maps. Higher Tigris to Tigris Leader. Elder Sikuku Predator to Blind Sikuku Cannibal. Sikuku High Chief to Bloody Sikuku Chief. Sikuku Dismember to Sikuku Dismemberer. Sacred Flames of the Sikuku Tribe to Lost Sikuku Fire. Sikuku Fleshlasher to Sikuku Tormentor. Elder Sikuku Predator (now Blind Sikuku Cannibal). Reduced the amount of monsters from each spawn point. It will rotate between 1:15am/1:15pm and 7:15am/7:15pm server time. If you run out of Fuel/Food whilst in one, you will now be taken out of it automatically. Edited Pets so that they can't be clicked. Fixed a bug where Gem effects could be partially visible through players and objects. Fixed a bug where you weren't able to move or chat if you were revived and clicked to respawn at the same time. Fixed a desync which sometimes occured on specific monsters when killing a monster for specific quest drops. Fixed a bug with character stats after riding in the cart back seat of another player. Fixed a client error that could occur when fighting the Desert Robot monsters. Fixed the text colour of Monster speech bubbles. Fixed a bug that prevented Gems from being disassembled from the Bunny Hammer and Carrot Gun weapons. Fixed [Little Street Vendor] Pony saying incorrect messages. Fixed a bug where some PvP Arena Objectives were being rewarded inside PvE Arenas. Fixed the Dodge Rate of the Level 10 Hawk summon being less than the other Hawks. Fixed a bug where the deletion confirmation popup would sometimes be hidden when moving the mouse on the Character Selection screen. Fixed a bug where the Zant Visitor Scroll played Christmas music when using the scroll. Fixed a few quest description errors. Fixed a bug where you weren't able to self-cast a skill after killing an object until you moved. Fixed a bug that caused the name of a zone to disappear quickly after entering. Reduced the flashing intensity of the Reindeer Antler visual effect. This update also adds in all required content for our upcoming Classic Beta weekend. Players are now assigned a random name at the start of every game in the format 'Player [Player ID]'. The Player ID is randomised every game. If you see 2 players or more forming a team, you can report them by using this command. For example, if the name of a player is 'Player 1234', you would type '/teamer 1234' to report them. Using this skill will open (or close) the in-game map. The skill is automatically placed into your quickbar at the start of the game. Added a potential fix for the storm effect position sometimes being incorrect for the first round. Blocked items being able to be equipped as costumes. If an item has been slotted with a gem, the gem will now drop separately and a new gem may be placed into the item. Up to 3 consumable items will now be dropped from a players inventory when killed. Mana requirements have been increased from 100 to 250. This will make Mana Potions more valuable to find, as they are largely ignored currently. We'll now reward these once you're being teleported away from Battle Royale to ensure your game client is ready to receive the updated objectives. Fixed a bug where your own weapon effects would be removed after joining a game. Fixed a bug where you weren't able to unlock the "Battle Royale - Triple Kill" achievement. Fixed a bug where the leaderboards would show time incorrect once your Time Alive count was over 25 hours. Fixed a bug/cheat where you were able to type /showdrops before joining a game and being able to see what items were without having to explore them yourself. You will now be able to see a randomly generated name for other players. You can use their name to report players who team, abuse or glitch whilst in a game.